It’s a blur, but you really don’t want to seen this thing coming for you anyway. It’s the latest look at what the folks at Boston Dynamics have been working on under a DARPA contract. They call it the Cheetah robot as it’s the fastest four-legged bot ever developed. The clip after the break shows it breaking the world record over 100 meters… for a human. This isn’t really legitimate since the run is done on a treadmill and the robot is tethered. But it’s still impressive scary. The Cheetah is a relative of BigDog, another Boston Dynamics robot which we’ve seen several times in the past. BigDog specializes in lifting heavy loads and traversing rough terrain. We don’t think it will be too long before both traits can be “bred” into one device. A lot of times when we feature these robots there are comments about how they invoke images from The Terminator movies. For us this is more along [Michael Bay’s] vision of robots from the Transformers series. It certainly not small enough or fast enough to be seen as an early version of the Rat Thing. Yeah but it can’t stand up. And it can’t stop, because the front legs are bent the wrong way. Attempting to slow down would just make them slip because they “ratchet”. Yeah, I don’t think it’s actually holding itself up. Got to feel sorry for the next generation of soldiers. Imagine this thing chasing you down. Definitely a bad day at the office. Imagine it chasing you with a machine gun on its back, thermal vision, and gyroscopiclly stabilized targeting with laser range compensation. And it doesn’t care about your suppressive fire. It doesn’t fear death like normal soldiers. That thing is terrifying. We need this video slow motion with the terminator theme music to it. Why would you think we would send this into battle without ammunition??? Its not meant to bite people. it can run you down in a long straight corridor. how well does it handle a zig zag? and, I’ve seen the big dog, it’s pretty cool. but adding momentum to speed, and snagging the front leg on a branch is going to send that thing spilling. so a tortoise shell might be in order. and then call the hare back for a rematch. progress? you bet. but let’s be realistic about what it can actually do. And don’t forget that boston dynamics only shows some stuff that they didn’t classify, and that might actually be ‘old’ by the time you see it. Part flys off at 00:14 (Bottom center of screen) — a foot pad maybe? Yeah, that was my guess. I’m slightly impressed, however, this is impractical, but the technology will just continue to improve. Did anyone notice that it actually runs backwards?! It doesn’t. Its front legs are backwards to gain leverage and more traction as they push back against the treadmill. Real animals have the same configuration for the hindlegs, but the forelegs are the other way around to make them dig into the ground when the animal wants to slow down. Not guns, knifes run us down slice us and move to the next screaming victim. Seen that in a few movies. I think we have some time before they get all the pieces together, I hope. I like to say I welcome our upcoming robot overlords, errrr, I mean protectors. True computer intelligence is still a long way off…they won’t be our overlords any time soon…but the people who control them just might be. That’s the real scary part…human armies can go a long way from morality but there is a point where they stop…tell a soldier to kill unarmed women and children and there is a chance he will refuse, especially if the woman is his wife and the children are his own. Robots do what they are told. Of course, an even more scary scenario might be as simple as a bug…if they are programmed to go after terrorists and a software update gets interrupted or something, they might calculate that anything with legs is a terrorist. It wouldn’t need to outrun most of the [HAD] crowd; most of us would try to catch the thing in order to open it up, replace the electronics with an Arduino variant, and make it go to war with the modified Roombas from the local hacker space. It’s very reminiscent of some of the autonomous vehicles from Daemon. How long till they start harvesting people’s dogs to be the brains of these things? Nevermind, somehow I missed the last sentence of the summary. The powerplant and controls seem to be sitting on benches and from what I can tell there is only movement at TWO joints. A stalker drone ala Red Planet this is not. But impress the right heads in the pentagon and sooner or later this thing’s descendants will be keeping some poor bastards looking over their shoulders when in straight hallways. I’ve seen faster robots. I think they are named cars. Doesn’t contain its own power, doesn’t balance, and only runs on a treadmill, runs about 35% the speed of a live Cheetah… It makes me really impressed by biological Cheetahs! but they also don’t have much power themselves. they have no endurance at all. Wow! The fall in the end was a surprise! Very funny! I wonder how the speed control works. Seems to me its not running at that speed, its just that the treadmill is running that fast under it. Kinda like being on a bike pulled by a car, I can’t pedal it that fast, I’m just along for the ride. How do you figure that running on a treadmill is the same as being pulled by a car? Because there’s no air resistance. You don’t have any force you need to propel yourself against, nor do you need to accelerate your body mass in any direction – you simply have to stay still while the ground moves underneath you. That’s analogous to being pulled along. How on earth did you come up with that analogy? Have you ever ran on a treadmill before? If I Usain Bolt had an arm holding him up he could probably go faster and have get more distance between strides. That robot isn’t pushing the treadmill to that speed, the treadmill is pushing the robot to that speed. And yes I have owned and used a treadmill before. I highly agree with this. I can run at 20mph (max setting) on the treadmill at the gym for about a minute before I want to die. On the ground though I know I cant go that fast. The treadmill literally resets your legs to the rear so all you are doing is just trying to stay up, and just like this robot, one mess up and you go face down. If you’re talking about accelerating, ok, but if you’re running on a flat surface at a constant speed, you’re not doing much more work than if you were on a treadmill. Sure you’ve got wind resistance, but that’s it. Running on a treadmill is completely different because we normally run (walk) by falling forwards and down, then lifting ourselves up, and falling again. Trying to simply move yourself forwards with your legs would see you falling over backwards. On a treadmill all you have to do is keep your feet under your center of balance on average, which makes you run more upright and reduces the amount of up-down motion your body has to make, simplifying the motion into just moving your legs back and forth. “The mechanical Hound slept but did not sleep, lived but did not live in its gently humming, gently vibrating, softly illuminated kennel back in a dark corner of the fire house. The dim light of one in the morning, the moonlight from the open sky framed through the great window, touched here and there on the brass and copper and the steel of the faintly trembling beast. Light flickered on bits of ruby glass and on sensitive capillary hairs in the nylon-brushed nostrils of the creature that quivered gently, its eight legs spidered under it on rubber padded paws. Woo I’m not the only one who thought that! Yeah, I was thinking this more than RatThing. Every successful all-terrain vehicle ever built has used conventional wheels, including the rovers used on the Moon and Mars. If that isn’t “all-terrain”, nothing is. Can someone explain to me what the value is of a legged robot that can’t outrace my 25 year old radio controlled toy truck? That is not all terrain. Wheels cannot climb stairs, move through dense forests. Wheels get stuck, legs can almost always unstuck themselves. Check out Rhex for a good balance between speed and terrain robustness. Personally, I think wheels on legs is the best of both worlds. Check out Nasa’s Athlete for an implementation of that idea. Very cool, but the fact that it is not even remotely supporting it’s weight is basically telling me that they made a robot that can move its legs really fast. I hope it gets to the point where it can run around! And because of this comment they will probably send one to kill me :). I hope so, that would be an AWESOME death!! Normally for the Boston Dynamics demos, the tethers do not support the weight of the robot, or add to its stability. Only if the bot goes outside of a predetermined range of motion (ie, it falls) do they catch it, to prevent major damage. 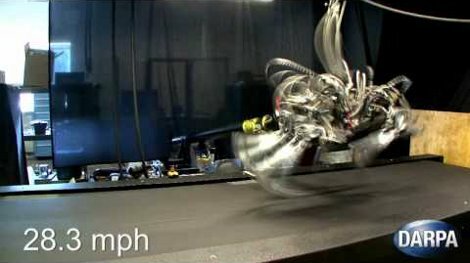 A robot getting hurled across the room at 28.3mph wouldn’t be pretty. Yeah it’s obviously supporting itself. The tether is only a limp power connection until the end where they tighten it when the robot falls. Will it turn or is it designed to run straight line? Reminds me of AMEE from the Red Planet (2000). Look at that thing go! Once these are improved we could invent a new dodgeball type sport. Only the ball has 4 legs, target guided and runs in 28 mph. Last man untagged (and standing) wins the round. We’d better find a soft padded shell for the robot first though. I, for one, WELCOME our new robot-monkey overlords. 24 mins, About mid point, You’ll get your dream.. Odd that boston dynamics doesn’t have a camera that can do the high-speed footage. The idea seems to have a base unit (BigDog) with a number of swarming bots that can neutralize foot-soldiers. Although their tests seem to indicate this dog is meant to support ground personnel in rough terrain (think mule) it’s becoming more clear that these bots are needed to close the gap in an Urban scenario. Looking at the arsenal and technologies available to the military this dog only seems to have one purpose and that’s surveillance and crowd control. Wow, realy… Firstly this is what R&D refers to as a proof of concept. Usualy the measurments and information attained from this designe will actualy be used later in an experimental modle. As far as the tredmill coment thing watch the vid again towards the end as the tredmill speeds up 27-28mph the rear legs begin to fail. Afraid of it chasing you. its not armoured (that would slow it down) grant you a mobile weapons plat would be perfect for this thing it would have to be about as large as a 22 or 5.56 though as the weaponsystem would destabalize the thing when fired. all in all well done… Lets keep at it. Oh and again not caring about this thing on a battle field its not armored and to manny critical parts easily penitrated by 9mm fire. and it is starting to be interesting. The real use will see packs of these things networked, equipped with targeting lasers, infrared, a kinect lol, etc to accurately designate drone strikes…and create a digital mapped battlefield for the networked, augmented reality “Land Warrior” of the near future. Like the spiders from minority report….